Phuket Marriott Resort Merlin Beach is a new 5-star hotel with a unique location in Phuket, just a few kilometers from the busy Patong and yet in a superb and quiet surrounding. Yes, the name sounds familiar because this used to be the Merlin Beach Resort, a popular but rather old hotel. So if you liked it before, you will like it even more, and those who didn’t like it because it was getting old will be happily surprised to see what they have accomplished here. 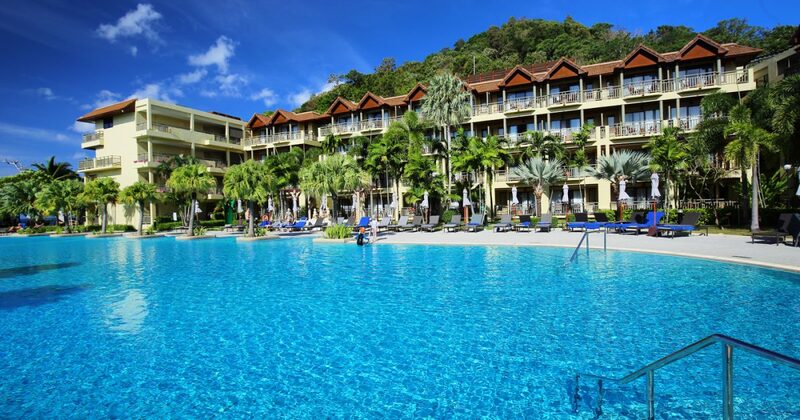 Marriott Merlin Beach Resort is a large hotel build on a vast land surrounded by hills and beaches. The overall layout hasn’t changed and the immense pools are still as beautiful surrounded but no less than 400 rooms. Apart of this, everything else is new and best of all: the new team is super nice and will make you feel at home from the moment you walk in. 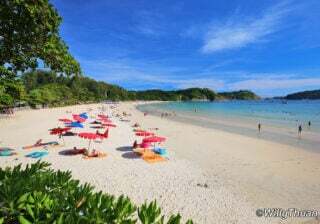 Not only the Phuket Marriott Resort Merlin Beach has its own beach but just around the corner you can enjoy more superb beaches, including the amazing Freedom beach, now famous for its incredibly white soft sand and superb water. If you know how difficult it is to get to freedom beach, you’ll be happy to hear that you can use a kayak from the hotel to get there. 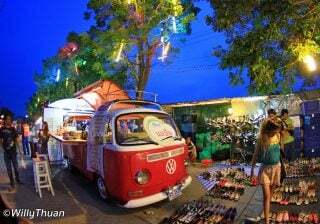 A little further, Paradise beach is popular for its tropical atmosphere and monthly full moon parties. 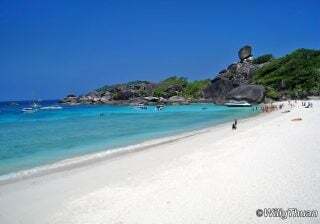 Then Tri Trang beach is just across the street, so you are spoiled with beaches! 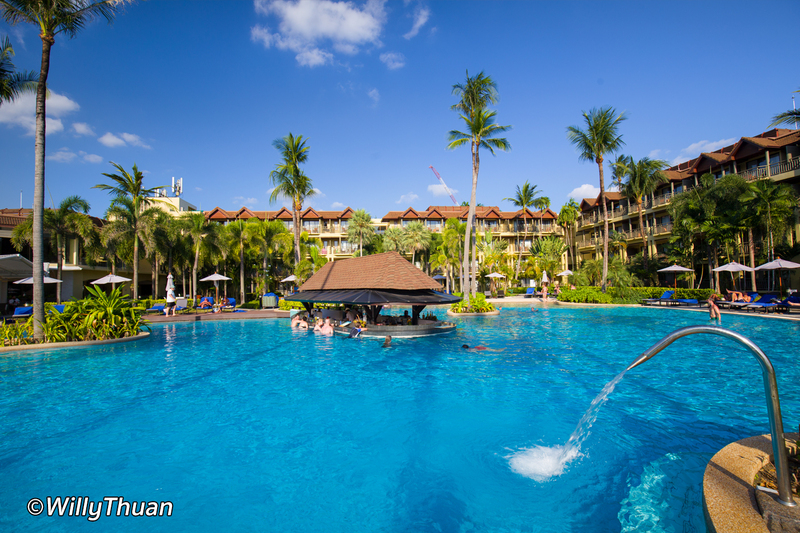 Phuket Marriott Resort occupies an immense piece of a beachfront land and doesn’t feel compact or crowded. 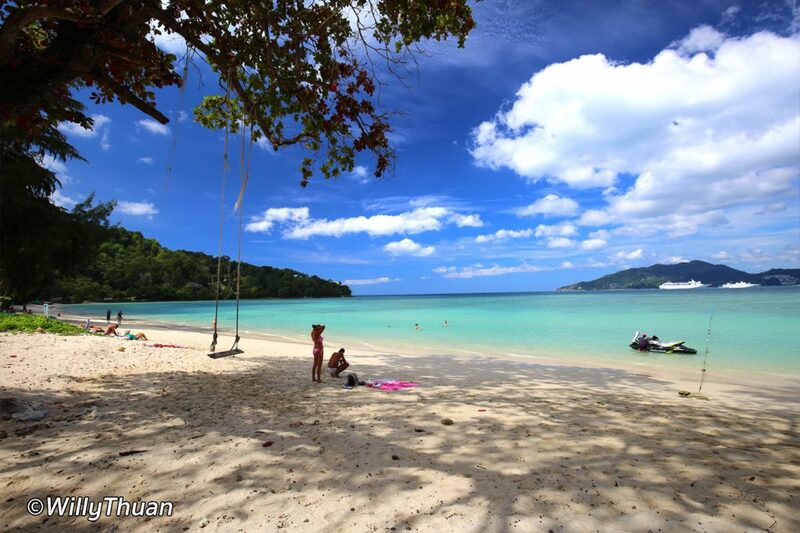 The bay might not be always good for swimming but it’s one of Phuket best snorkeling spots (if not the best). What we also loved are the immense palm trees standing everywhere above the swimming pools, creating a tropical backdrop for your holiday selfies. Each photo turns into a holiday postcard. 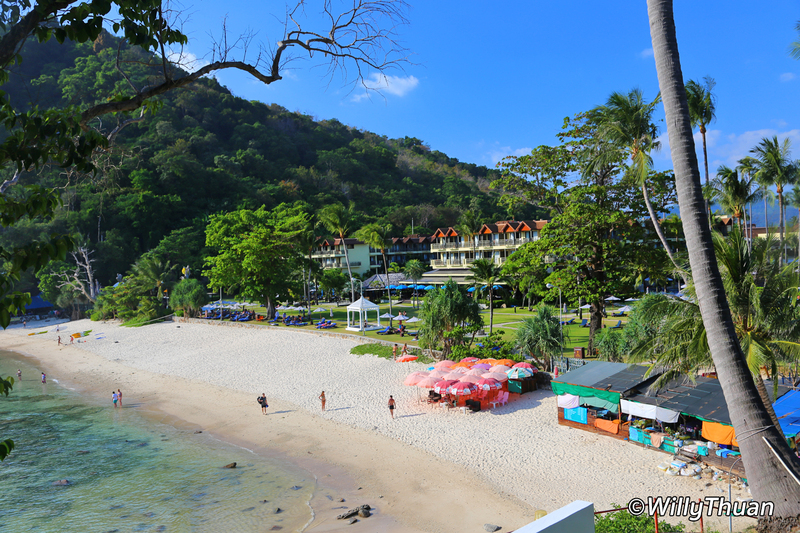 The garden between the hotel and the beach is a lovely place to spend the day suntanning or taking part in the many activities such as yoga or Muay Thai training, and with easy access to the beach or the restaurants. 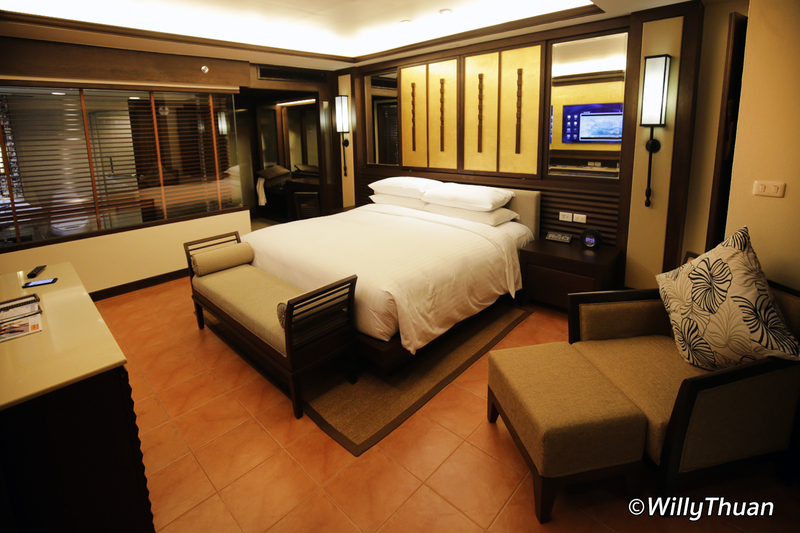 The rooms just like the entire resort have been refitted with a better layout and setting, taking advantage of the space. 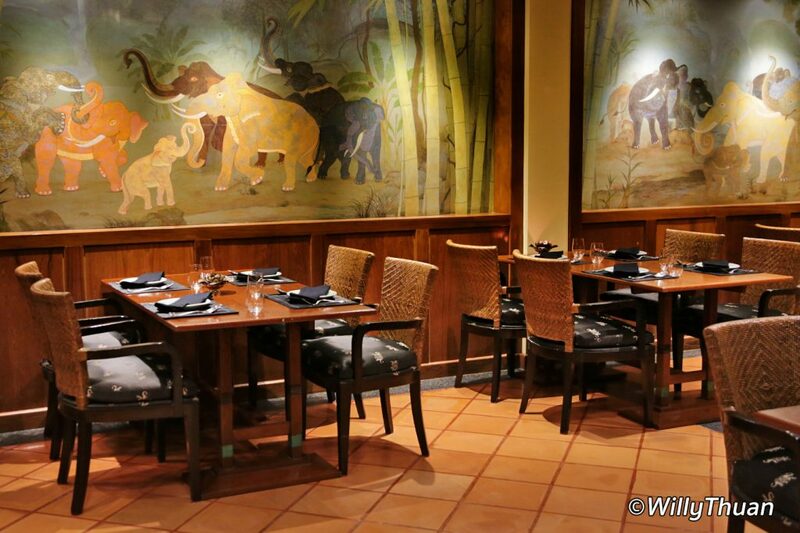 The style is contemporary Thai with warm tones, a lot of wood and terracotta floors. 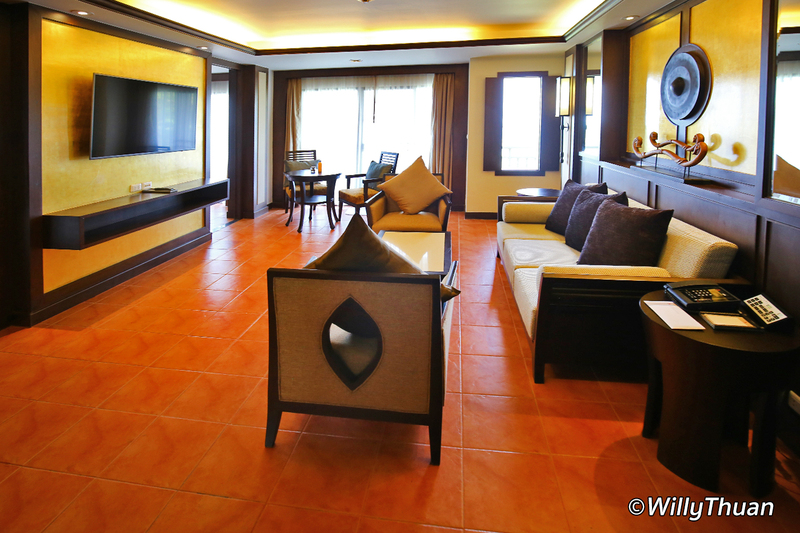 All rooms have comfortable balconies to enjoy the pool or ocean view. As usual we checked how many electric and USB plugs we could get in the room and we had more than we needed. This is a 5-star international brand so all the amenities you can expect are available: fridge, bathrobe, slippers, dryers, safe box, you name it. An espresso machine would have been nice though, seems to have become common in all 5-star hotels of Phuket. The bath products are from the famous Thai brand THANN, which is a nice touch. With 400 rooms you can of course expect a lot of room types, no less than 11 to be precise, mostly pool view and pool access but also beach view and beach access suites. Those with sea views are of course the most popular but these are not many so better book early. 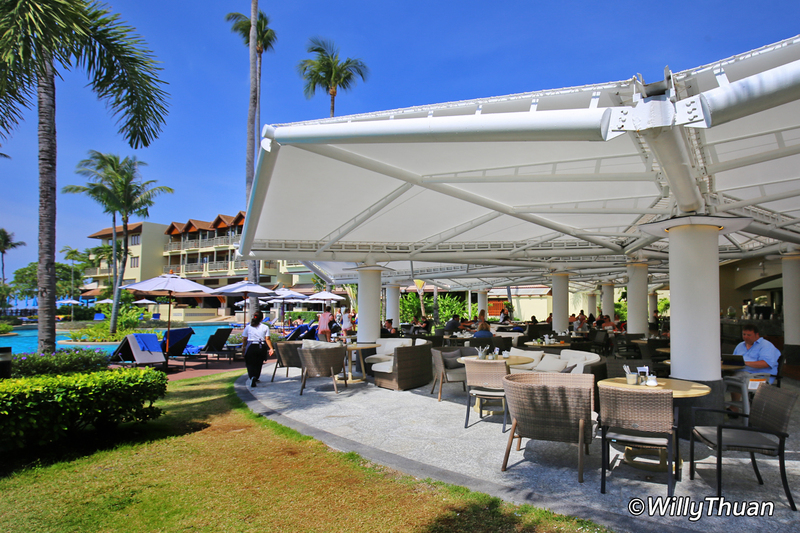 Phuket Marriott Merlin Beach has a nice collection of excellent restaurants. On the first days we tried Thai Pantry which serves Thai dishes with a modern touch, which doesn’t sacrifice the authentic taste. We asked for ‘spicy’ as we know that often restaurants in hotels tend to tone down Thai food. We got our dishes really spicy, just the way we like it. We tried the classic Tom Yum Goong (a traditional Thai spicy river prawn soup – 280 baht) and a Neua Pad Kraphao (Wok fried beef tenderloin with hot basil and chili – 380 baht). We tend to order classic dishes as it usually is a good way to taste the authenticity of a dish. We were not disappointed and we could see that our neighbors were really enjoying their dishes too. The next day we paid a visit to DOCG, an excellent Italian restaurant with great traditional cuisine and a good wine list. We ordered a Beef Carpaccio (290 baht), Calamari Fritto (290 baht) and the dish of the day: a Beef cheek. The beef cheek was big and intimidating but surprisingly light and tender, we had no problem finishing the whole dish. And don’t miss a chance to try one of the cocktails mixed at the restaurant. I had a ‘Count’s Negroni’ that was so good I think I actually ordered 3 times (325 baht). Merchant Kitchen is the largest restaurant, serving international cuisine but mostly that’s where you’ll get to enjoy your breakfast buffet. The seats outside by the pool are of course the best as you get to enjoy the amazing blue and palm trees but it gets busy pretty fast. 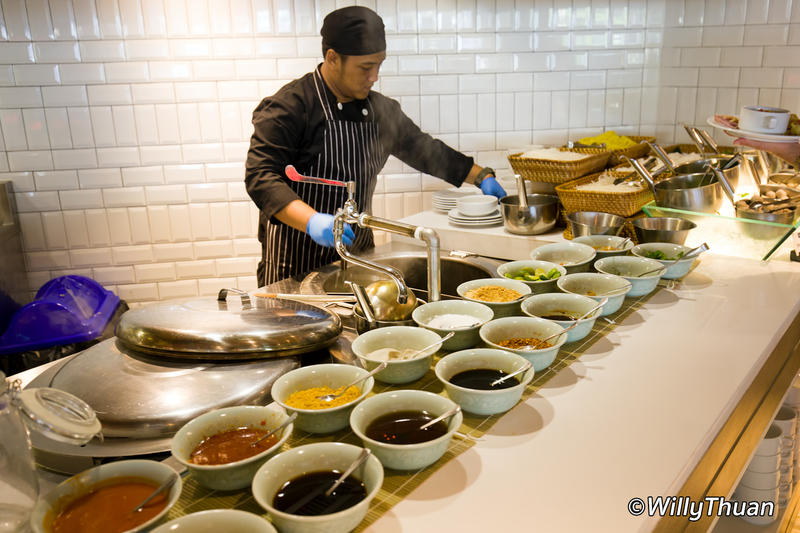 The buffet is huge with a bit of everything for everyone, just as we expected. And because Marriott is a holiday resort, the buffet is open until late! During the day you can take a break at Beach Grill, a garden restaurant open all day and facing the sea. For us it’s the perfect location for writing… and once we get tired we just take a swim to the pool bar, always the best way to get that unique holiday feeling! This is definitely a good family resort. The Kids Club is not too big, just the right size for children to feel comfortable and not isolated. Everyone seemed to be happily busy with their friendly team and plenty of activities and games. As expected it’s very colorful and well designed, equipped with plenty of interactive games and near the pool and its water cannons and super popular water slider. You can of course get a baby sitter if you request a day before. 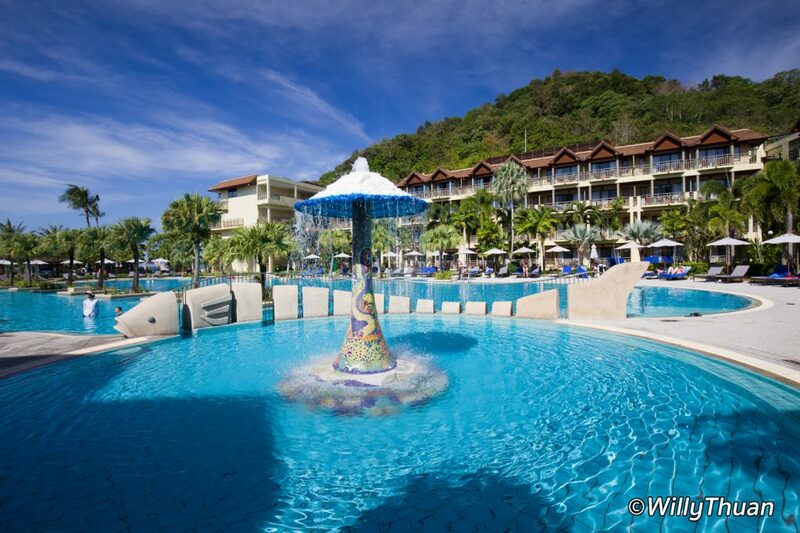 If hanging by the pool all day is not your exact vision of a tropical holiday, Phuket Marriott Merlin Beach has a lot of unique activities to offer. The hotel is the only one having a healthy coral house reef just in front of the resort, making it a unique base for snorkeling and even beach diving. Best of all, there is a dive center in the hotel so don’t miss this chance to do your first steps during your stay, it’s easier than you think and since you can dive directly from the beach it can be done in half a day only! The ‘Try Dive’ for beginners at the house reef starts at 2,900 baht, it’s a great opportunity and you might get to see some sea turtles. Normally even the most basic diving experience tends to consume an entire day. Here you can have the rest of the family enjoy something else at the hotel while you dive. Even better, make it a family experience as kids can start as you as 10 years old. 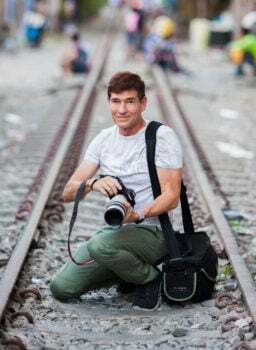 How unique is this! 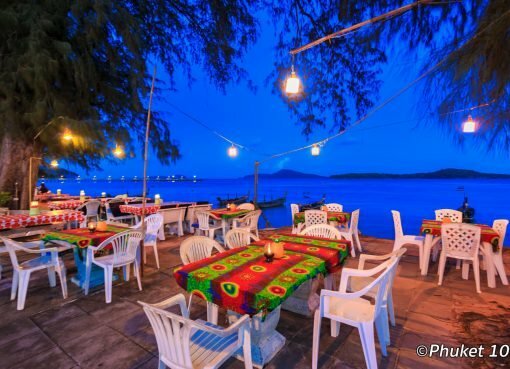 Once you went through your basic dives you can get more serious and embark on a real diving holiday and take a diving course, it’s all available at the hotel. 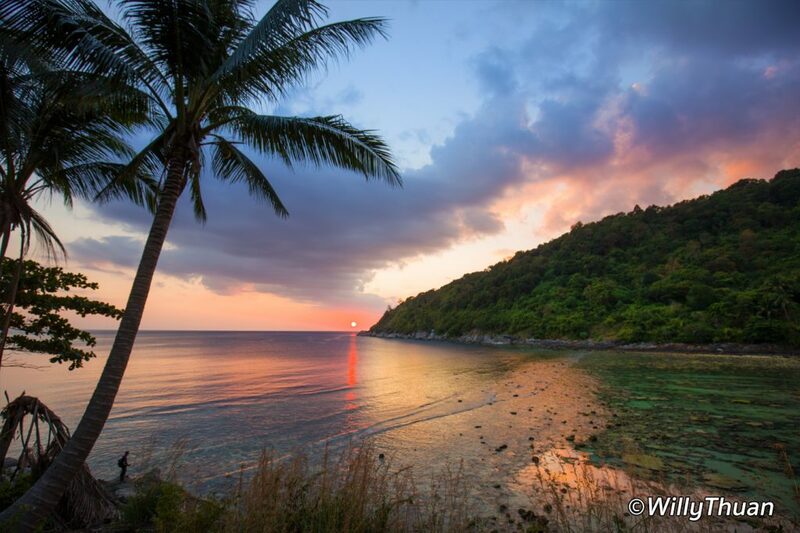 You can even take daytrips to dive at one of the amazing islands around Phuket. Phuket Marriott Resort is also developing a friendly butterfly garden on the side of the hotel. Don’t go imagining a large enclosed cage with hundreds insects. This is actually an open garden growing the right type of plants butterflies seek for food and reproduction so butterflies will come on their own will. That is still mostly a project but it will be interesting to see it succeed. 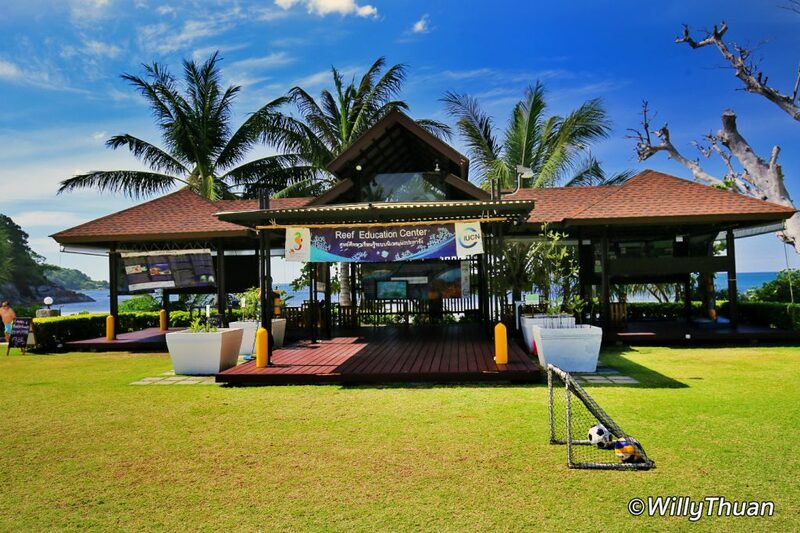 Activity center: snorkeling, kayaking and house reef diving! A hotel in Thailand would not be a true 5-star without a good spa. The spa features 6 treatment rooms including a couple room and offering the full array of treatments: facials, body scrubs, body wraps, and couple massage. Not only the spa is great to relax and help adjusting your jet lag but also perfect after a long day of exploration or to cool down a sunburn. And as everyone knows spa is the first place everybody think about on an occasional rainy day, book early! Great staff is what makes the difference in a hotel!